The Cliff Dwellers monthly Saturday morning book club is honored to have Ethan Michaeli as our guest on February 25 to discuss his book. The discussion begins at 11 and is free, and Mr. Michaeli will be staying afterwards for lunch for which you will need to make a reservation at reservations@cliff-chicago.org. Mike Royko passed away nineteen years ago today. Hard to believe! My morning newspaper experience has never been the same. His column, on page two, was the first item that I turned to. Now my first read of the day tends to be either the obituaries, sports, or weather. For thirty plus years, you would consistently find something witty, hard-hitting and satirical in a Royko column. Occasionally you would be surprised by how lyrical his words could be, revealing a softer and kinder nature, defying his gruff public image. I believe that Royko’s Boss, an account of the life and times of Mayor Richard J. Daley, remains one of the best biographies ever written about an American politician. The Cliff Dwellers book club will be discussing Boss on Saturday May 28 beginning at 11:00 a.m. I will moderate the group. Although it is Memorial Day weekend, perhaps some of you who are in town and have some free time, would like to join in on the discussion, which promises to be lively and informative. Comment on this post or email me at richardreeder34@gmail.com if you have questions or would like to attend. The Cliff Dwellers Book Club Welcomes Libby Fischer Hellmann on April 16. Libby Fischer Hellmann, the award-winning, highly acclaimed Chicago-based mystery writer, will be discussing her book, Set the Night on Fire, at the Cliff Dwellers Book Club this coming Saturday, April 16. The book is a thriller, set both in Chicago of today and in the politically charged years of 1968-69 with the backdrop of the Democratic Convention, Days of Rage and the SDS convention. It should be a fun discussion, especially for those of us who were politically active during that time. Now in our third year, the Cliff Dwellers Book Club features Chicago writers, both past and present. Occasionally, like Libby on April 16, contemporary writers show up to engage in a lively dialogue with the book club. The public is invited, and the conversation begins at 11:00 a.m. There is no charge to attend the book club. Many attendees stay afterwards to continue the discussion over lunch. The Cliff Dwellers is located at 200 South Michigan, across the street from the Art Institute. If you cannot make this one, consider a future book club. The remaining calendar is below. The “street-punk novel” is part and parcel of the Chicago literary tradition. Nelson Algren’s Never Come Morning, which came out in 1941, chronicles the life and times of the Polish-American young hoodlum Bruno “Lefty” Bicek. Six years later, the African-American writer, Willard Motley, had his debut novel Knock on Any Door published, featuring the young Italian-American protagonist Nick Romano whose purpose in Motley’s words was to “live fast, die young and have a good-looking corpse.” Those same words could be applied to Mookie and J.C., the main characters in 47th Street Black, the 2003 debut novel of Bayo Ojikutu. Mookie and J.C., like Bicek and Romano are killers. All are born into a tough world, where the streets are mean. Not only are all intent on mere surviving, but they all want to make something of themselves, to become “big shots” in the urban ghettos where they live. They are driven by money and status, living their own twisted version of the American dream. The Cliff-Dwellers Book Club will be exploring the genre of the Chicago “street-punk novel” in three of our sessions this year. We begin by having Bayo Ojikutu as our guest on February 28 as he discusses 47th Street Black. Exactly a month later, on March 28 (Nelson Algren’s birthday), we will discuss Never Come Morning. On August 22, we will have a discussion of Knock on Any Door. All these discussions are on Saturdays, beginning at 11:00 am. They take place at the Cliff Dwellers, at 200 South Michigan, directly across the street from the Art Institute. They go on for about an hour or so, often times continuing over lunch. For more information please email me at richardreeder34@gmail.com. Over this past year, Ruth Aizuss Migdal has been a regular participant in the Cliff Dwellers book club, which I moderate, but more importantly she has become my friend. I so enjoy her enthusiasm and insights, and her vigorous approach to her work, at a time in life when most others have retired to more staid interests. Ruth, you see, is a sculptor, and one of the best in Chicago. She just finished a magnificent piece entitled “Whirling Dervish,” which has been recently installed near the lagoon and field house in Chicago’s Douglas Park on the West Side. Those of you with Chicago literary interests know that Douglas Park has been featured in the stories of Meyer Levin and Stuart Dybek. In the past, one could hear the sounds of klezmer and polka in this public space, nowadays replaced by hip-hop and salsa. The park still looks good, and invites you to stroll along its paths and take in its beauty during all of Chicago’s varied seasons. 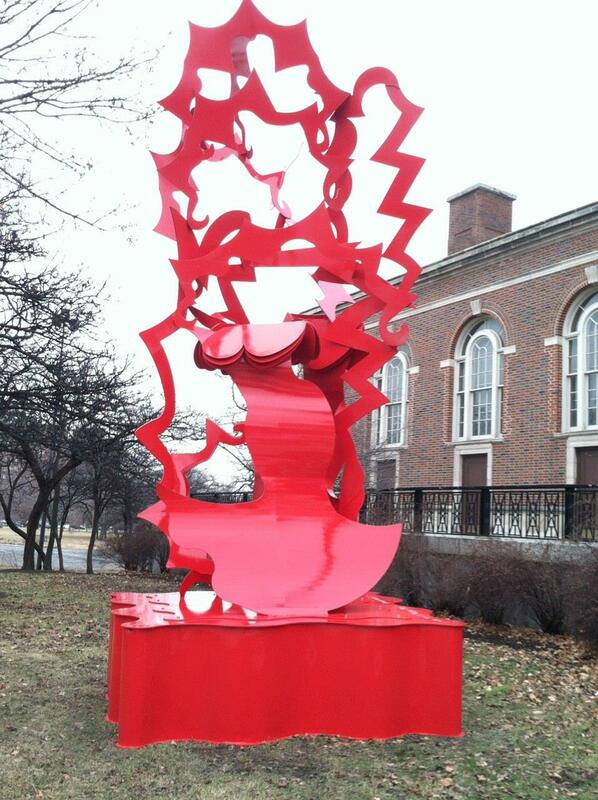 Please make sure you stop by to see “Whirling Dervish,” the latest addition to the cultural landscape of Douglas Park.